The Jarhead Nation sure knows how to throw a birthday party! The latest example comes from Brian Akers over on our Jarhead Nation Facebook page, who shared the accompanying photo from November 10, the birthday of the U.S. Marine Corps. 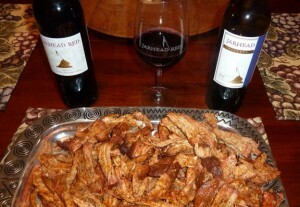 According to Brian, it’s a family tradition of his to celebrate the Marine Corps birthday with barbecue and Jarhead Red, although the meat varies from year to year. And he’s so dedicated that he takes November 10 off as a holiday, even when it falls on a weekday! You may recall that Jarhead Red was conceived by Adam Firestone in 1999 as a celebratory bottling for the annual Marine Corps Scholarship Foundation’s Birthday Ball in Los Angeles. Over the years, the wine gained a following by word of mouth and was enjoyed at Birthday Balls around the country. To meet growing demand, Jarhead Red was ultimately released for distribution and is now available nationwide. Cheers to Brian and all of you who join us in raising a toast to the U.S. Marines!